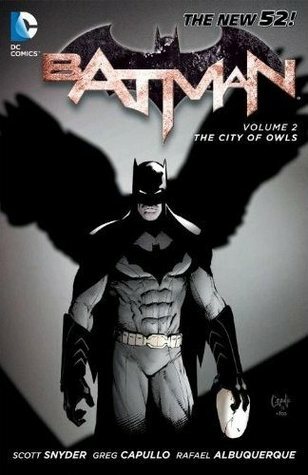 Scott Snyder brought new life to the Batman franchise when he introduced the Court of Owls and their assassins, the Talons. With them, we had a villain that felt the equal or better than Batman/Bruce Wayne. We also had the other side of the coin. Rich people manipulating the fate of Gotham from the shadows, but not in the altruistic way Batman does. In Batman Vol. 2: City of Owls, Gotham’s vigilante protector has managed to escape the claws of the Court with his mind and body barely intact. The Dark Knight has won the battle with his deadly new aggressors, by certainly not the war. These villains will threaten all that Batman holds dear: His secret identity. His home. His headquarters. His beliefs about both his friends and his enemies. With the Court’s deadly foot soldiers, the Talons, out to destroy him, Batman and his allies must now wage an all-out war for survival against the most dangerous predators he has ever encountered. The story and art are fantastic. Snyder’s writing is only enhanced by Capullo’s art. It’s a match made in heaven and again the Batman franchise is in a resurgence with new energy and ideas. My issue isn’t with the story or art, it’s the price for what you get. This hardcover edition retails for $24.95 and you get Batman #8-12 and Batman Annual #1. Compare that to the recently released Batman: The Nite of Owls which included Batman #8-9, Batman Annual #1, Detective Comics #9, Batman: The Dark Knight #9, Batwing #9, Batman and Robin #9, Red Hood and the Outlaws #9, Birds of Prey #9, Batgirl #9, Nightwing #8-9 and All-Star Western #9 for only $5 more. There’s some overlap there, and you get more for $5. So, it’s really up to you as to how you want to collect this storyline. The most important thing though is, you collect this story, it’s that entertaining. I didn’t know DC collected the Night of the Owls itself in a seperate trade. Granted, I read the Batman issues collected here while ignoring the tie-ins for the most part. So maybe I should get that trade some time. Maybe. Or maybe I’ll just pick up the trades for each series at some point. The problem with trades comes when the company decides to cross over a lot with other books, which makes it very easy to miss something important if the publisher neglected something. Although my biggest annoyance with DC’s trades these days is the OMAC series. Sure, all eight issues of the recent series were collected, but then DC Universe Presents went and included a few pages in their zero issue that has essential background information not included in the trade. And since OMAC sold so poorly, it’ll probably never get an updated trade that includes those few pages. And if you didn’t know that the DC Universe Presents trades had it, you’d be completely out of luck. Assuming you even cared about OMAC. I did, hence why I bought all the individual issues. But most people probably don’t, hence why it sold so poorly.That’s the problem with being a comic reader. If you bet on the wrong horse, you’re sunk with a series canceled early and never given the trade release it deserves. Oh right, this post was about Batman. Yeah, this story was great. Buy it. Yeah, that’s an issue with the trades and my issue with this one. If you bought the Night of Owls, you have almost everything that’s in this trade.